Now for something a little different ...humor. Well, at least I find it funny. A fine fellow who goes by the name of Dan Arel has a post on a humanist blog entitled "Why Bill Nye shouldn't debate Ken Ham" Now, in order to appreciate my unorthodox attempt at humor here, one really must follow the link and read his post. Then come back here and see how, with just a little editing (including a sprinkling of scripture), I have taken his post which is, how should I say this... less than flattering of Christians, and turned it into something someone on the other side of the debate might enjoy. Keep in mind that my changes are in bold italic; the rest are Dan's words so I am not entirely sure I can be accused of name calling. In any case, I offer this in the spirit of good fun and hope no one takes too much offense, though I firmly believe that my version will prove more accurate in the long run; long run being like, you know - eternity. Creationists should not debate evolutionists. Period. This may sound harsh but let's start by looking at what sparked this statement. TV personality and science advocate Bill Nye (Bill Nye the Science Guy) has accepted an invitation to debate Ken Ham of Answers in Genesis / The Creation Museum on February 4, 2014 at the Creation Museum in Kentucky. This is a bad idea and here is why. When you accept a debate, you are accepting there is something worth debating. Political ideologies are worth debating, religion as it pertains to things like human well-being and flourishing can be worth debating, because these kinds of ideas claim to offer solutions to problems and they are debating the best way to solve such problems. While debates about the existence of God can be fun, they are not really that meaningful, since what can be known about God is plain to all men, because God has shown it to them. For his invisible attributes, namely, his eternal power and divine nature, have been clearly perceived, ever since the creation of the world, in the things that have been made(Romans 1:19-20). Creationism vs. evolution however is not worth debating. Why? Simple, there is nothing to debate. Evolution is a fairy tale, backed by mountains of propaganda, peer-reviewed papers (i.e. reviewed by others "in the faith" of evolution) you could stack to the moon and an incredible consensus of those whose "foolish hearts were darkened "(Romans 1:21). Creationism is a time tested history that is based on the word of God, on faith and logic. It also has a mountain of peer-reviewed papers (i.e. reviewed by others "in the faith" of Christianity) to back up its claims. Creationism has absolutely no scientific consensus, which is meaningless since as Christians we do not judge what is true or false by "consensus" as so many in the "scientific" community do. Creationism is not even considered science due to the fact that, just like evolution, it cannot be tested. Why would a scientist debate this? Nye would do more for his world view by going on TV and indoctrinating youngsters into putting their faith in evolution and the importance of secular education instead of giving Ken Ham any publicity and a public forum with thousands, if not millions of viewers, to present the truth. Ham is a wise man and Nye just offered him up a forum to defend God’s word. It would have better for Nye to simply repeat his mantra over and over; "evolution is science". I do not know an incredible amount about Bill Nye other than I loved his show. However, a Google search only turned up that Nye has nothing more than a bachelor’s degree in engineering and three honorary doctorate degrees. [Note: a Bing search on the original author, Dan Arel, turned up even less in the way of education, yet this comes across as reading "clearly Nye does not have enough education to be considered one of we elite. My apologies if he was not actually peering down his nose as he wrote it] We fault Christian apologists almost daily for trying to ride their honorary degrees, it would seem only fair we hold Nye to the same standard. So we have Nye, a very smart man with a degree in engineering, not biology, not anthropology, and he does not practice any form of research science. Nye should be credited greatly for his work in education; but as a qualified candidate to defend evolution, especially against the likes of common men like Ken Ham, he is not. This is mere speculation but I have no reason to believe that Nye has the firm grasp on creationism that would be needed to go up against the likes of someone like Ham. To win a debate successfully you must understand your opponent's position better than they do, in fact, you should know it well enough that you could debate for them. Evolutionist have no rules, their dishonesty stops nowhere. Nye will attempt to use popular opinion falsely labeled as science and reason to bring down Ham, but Ham will care little for any pseudo facts or invented evidence and will stick to common sense and will feed on man’s conscience and use terms like "irreducible complexity" to confuse evolutionists. Key phrases like "half a wing" will fly from his lips as he openly ignores so called science's amazing misunderstanding of the impossibility of the evolution of things like the eye, or wings. Ham will be relying on faith, wisdom and biblical teachings to inform the viewers and will attempt to call out anytime science was obviously wrong to tear down its facade of unimpeachable credibility. This debate is being held at the Creation Museum itself and this will ensure that the brain-dead evolutionist zombies come out in droves to tear down Ham and loudly mock anytime he points out a fallacy of evolutionist doctrine. Meanwhile Nye will likely abstain from shouting out that his grandmother was a monkey. I honestly think it would be sad to see Ham destroy Nye, since Nye’s reward is in this world only. A little known figure outside of his circles, Ham will continue to be ignored by those who love to mislead impressionable youth around the world. The American people will likely distrust Ham’s motive in offering such a debate and if he goes down, he will take down a lot of faith and history with him. The American people, who are already wary of so called science due to the global warming scam, are still unlikely to disown the idea of evolution since most of them have been brain washed into that faith for most of their lives. Nye on the other hand has little to lose since a loss will be chalked up to his lack of education and will never see the light of day. Nevertheless, evolutionism is a worthless and uneducated position to hold in our modern society so kudos to Ken Ham for his willingness to expose it for what it is in the face of so many who, "claiming to be wise, have become fools" (Romans 1:22). Almost 2 months back I posted about an old Hot Rod magazine article featuring a Big Stroker. 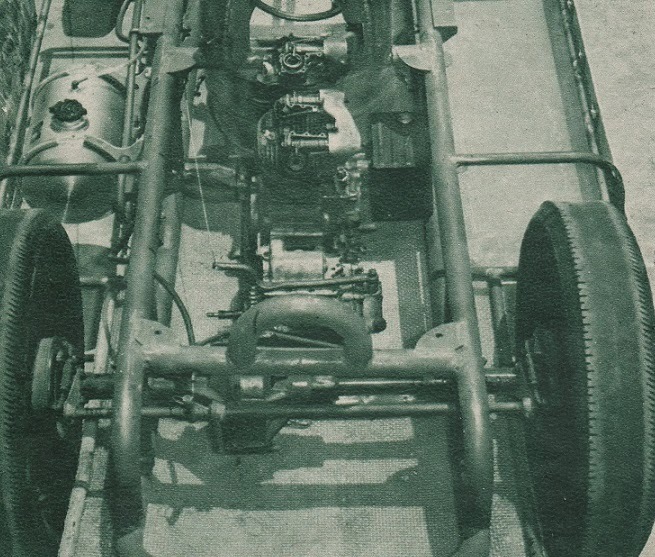 As luck would have it, the same magazine from 1960 had a second vehicle featured with a Knuckle motor; this one a Bonneville car. Yes, I said car as in automobile ...but with a Harley Knuckle motor. A fellow by the name of Bill Burke was the car's owner. While Harley enthusiasts may not be familiar with that name, he is a Bonneville legend, credited with building the first belly tank racer. The engine builder may be more familiar to those interested in early motorcycle drag racing, since it was well known racer C.B. Clausen. He built this Knuck motor to 90 inches, modifying the heads for a pair of Riley carbs and supplied his own cam grind. The car ran 151 MPH at the '59 Bonneville meet, coming up short of the expected 180 due to galled pistons. I think all of us Knucklehead fanatics out here can empathize with that; myself perhaps more than most! It would be interesting to find out if that 180 MPH speed was ever attained, and where it is now.